Interested in going solar in California? Who wouldn’t be? Do you live in California? Are you interested in going solar? Then it’s your lucky day. Given the wide range of incentives to choose form, plus the state’s hefty renewable portfolio standard (RPS), installing solar power in your home is easier than you think. Here’s why you should, and options on how to go solar to help you get started. You may already recognize the environmental benefits and savings on energy costs that come with installing a solar energy system. That said, powering your home with clean solar energy can increase the overall value of your home, and it’s easy to do. California Solar Initiative (CSI) rebates allow homeowners to choose from a list of rebates to lower the cost, along with alternative financing or leasing arrangements. Plus, California’s RPS requires the state to hit its renewable energy target: 33 percent of energy used must be renewable by 2020. They want you to upgrade to a solar system — it’s a win-win for everyone! One of the most popular options for California homeowners are residential power-purchase agreements. Essentially, a third party offers a fixed price for the solar system or electricity produced during the time of the contract, usually between 10 and 25 years. If you go with this plan, make sure to get an energy audit prior to installing a solar system, since you need to make sure your home meets building efficiency standards. It’ll also lower the upfront costs of your solar system, and the state provides rebates for these upgrades. Photovoltaic power generating systems (also known as PV) are what turn sunlight into electricity. 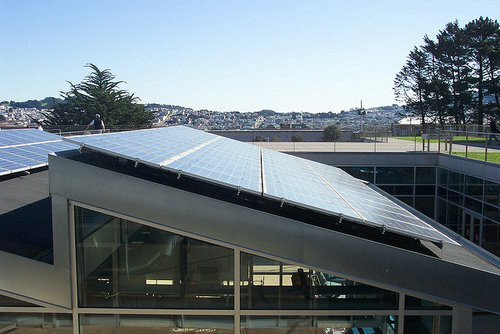 The sun hits PV panels, which generates an electric current that is converted into electricity. But the electricity your residential solar system produces goes farther than you think. Your monthly bill includes a credit for excess electricity, which can be applied to your electric usage over the year. Yes, even on cloudy days — and at night — your solar system is still generating power. For many, this excess electricity spells huge savings. More: Why 2015 is the best year to Go Solar In California.